This was to be a single-use office building, and the new curb cut was needed because unfortunately the owners of the property to the south did not allow the developers to borrow their parking lot entrance. This portion of College Avenue also does not have alley access. It was initially denied in part because it was out of character with the surrounding houses. Regardless of the reason for denial, it was not a truly mixed-use building. The site plan would actually set a precedent for future curb cuts and parking lots that are larger than the building footprints. While I like the design of the office building, I do think there would have been potential for a stronger proposal if the Red Line were in operation. The developers could see less of a need for off street parking and a curb cut. I admit that my initial reaction about the city Planning Department’s decision was hasty. The city doesn’t need this project as much as it needs better transit. So let’s do that. Thats an odd way to think about things considering these projects are not mutually exclusive and are not even funded by the same source. We should stop letting people stifle development. Everybody has a concern about some claimed externality. The bar continues to be set lower and lower for what that might be. Let the developments build on the land they own. It’s not Indy’s communal land, it is not the neighbor’s land. None of those people paid a dime for it. Let them build. I’m thinking about it in terms of what Indy has and what it doesn’t have. It has plenty of streets lined with single-use office buildings, but it is lacking in truly urban corridors without needing a deference to auto infrastructure at every parcel. North College Avenue would be a great place to have something like that, but first we need to run the buses there more often. I live in the neighborhood and long for improved transit as well as an improved pedestrian and bicycling experience along the College Ave corridor. That said, the city doesn’t seem to be taking much action in this direction. This intersection is a traffic sewer with five lanes of traffic, wide radius turns, lousy sidewalks, and a plethora of curb cuts and parking lots. This development doesn’t move things forward, but I also don’t think it worsens the situation. I guess I’m just confused, the city seems happy with the status quo here, but won’t approve more of the same? Any idea of the specific reasons this proposal was denied? Regarding the proposed office, it was a tough argument either way, probably reflected in the 5-3 vote. The “Plan” pretty clearly said it wanted the current stretch along College to remain residential business, which meant leaving the houses intact. The discussions at the Plan meeting indicated this was supposed to provide a buffer between existing commercial nodes along College. Still, this construction would have taken commercial structures no further north along the east side of College than it already existed on the west side. My guess is that the folks developing this really wanted the advantage of owning their own building (they’re real estate property managers, with clientele in the area) more than they wanted to manage their own retail tenants in their own building. There are probably opportunities for them to still accomplish their goal in the general area, as both Broad Ripple and Meridian Kessler are attempting to market vacant, or potentially vacant properties in their respective areas. I’m one of the partners in the 59th & College project and I’ve enjoyed the responses to this post. Reliant Partners offices in Broad Ripple in the newest Class A office in Broad Ripple called Rockdale @ 6338 Westfield. 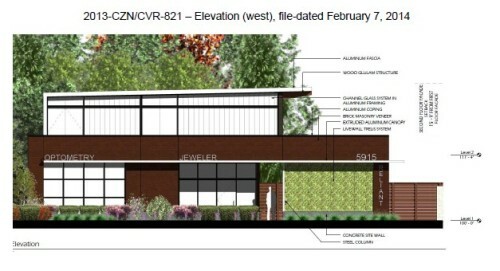 Also we lease one of the few (when I say few I’d say 3) Class A office buildings in Broad Ripple called the Veranda. We’re wrapping up a lease at the Veranda and it will be 100% leased and Rockdale is 100% leased. We see a demand for true, professional, Class A office space in Broad Ripple and Meridian Kessler by tenants who do not want to occupy space in a resi/commercial house. No disrespect to those structures but they are not a fit for all companies. Hence we embarked on a search to find a building or site that could accomodate a Class A office owner-occupant like us. We could not find a building, land or site that was a fit or economically made sense for this tenant profile. Lots of overpriced and rough properties in need of repair/upgrades. 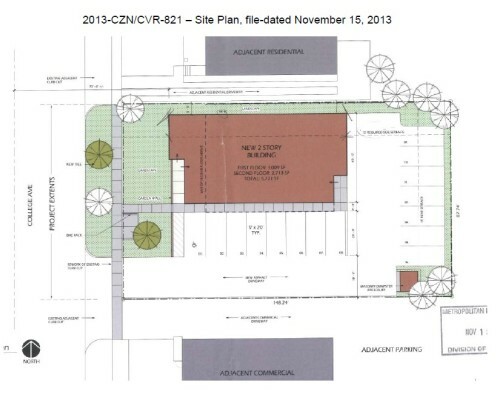 As such we identified 5915/5925 N. College as this ideal Class A office or mixed use site. With the transition of the former Fox Studio building from a daytime, low traffic, owner-occupant building to a vibrant multi-tenant retail building with an evening restaurant/bar, our properties are a logical transitional buffer to residential to the north. They sit directly across from C-3 zoning and next to a multi-tenant, retail building zoned C-3 too. They clearly are located in a commercial node and our project serves as a beautiful buffer and enhancement to this node/area. Unfortunately with all of the support we have (neighbors, adjacent tenants, BRVA, Forest Hills, Midtown Indy, 3rd District Town Councilor, etc.) we are fighting to get our approval. If you feel inclined to support or further discuss feel free to contact me. 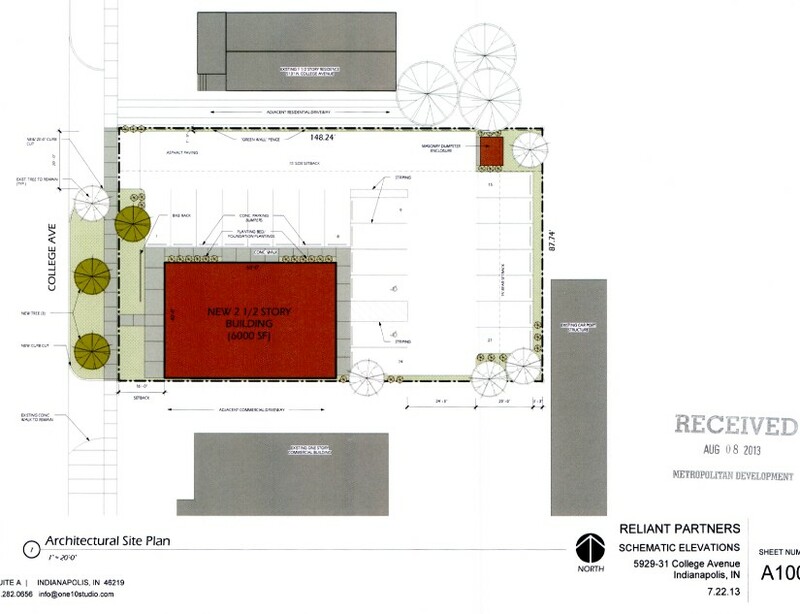 E-mail: scott@reliantpcr.com and cell# 506-7885. We have a final re-hearing on March 19th @ 1pm @ City-County Building. Good evening…Scott L.
Kevin, we will never achieve levels of urban density in Meridian Kessler/SoBro that Jane Jacobs observed in Greenwich Village…which is what it takes for many of the buildings along a commercial corridor to be mixed use. I think it’s far better to argue for mixed use districts or corridors, where each building may or may not be mixed-use. In other words, let people live next to offices and restaurants and zone more areas to allow it. Just a block north of this site is a small apartment building surrounded by single-family homes, across the street from some big houses converted to offices. A lot of these arguments revolve around single-use zoning classifications arranged by “wise” planners of the past who lacked market savvy and essentially froze what’s there already, while allowing a little tinkering around the margins. As a result, neighbors think they are entitled to have things stay the way they’ve been for 30 or 60 years. And area plans dance around that detail. Every one of these intensification or increased density deals, especially in Broad Ripple, becomes a huge argument and a long tribulation for the developer because it requires a variance.